Writing is part of my life but I am finding although I want to make money at it, sometimes the monetary part of the equation takes the fun out of the pure act of writing what comes to my heart. I also am finding that if I combine the writing with other passions ( for me the love of fabric, quilting, and kids) I am able to create with words and the money will come. Does it make sense? Maybe not to six figure authors which of course I am not, yet. But in reality words are part of every hobby, craft, conversation, or story I create. Why can't the money follow? Do I still need to market? Of course marketing takes a major role in any product I am producing. I am creating stories to go along with the fabric packs from our little Nashville fabric shop. The story is a part of the product and becomes a marketing tool. for the fabric, the shop, and the town. And the story can become part of a bigger product outside of the shop which is also on my planning board for the future. The lesson here is that life brings with it changes, changes in your interests, changes in what you are passionate about, and changes in life style. Use those changes to create more with your writing rather than less, to increase products for your niche market and to step outside the box and create products in a new niche or genre. I keep these tips in mind when following my passions. 1. I continue to keep to three major writing goals because it will help to focus my new passions. My writing and creating now will be focused on new major goals. 2. I won't be afraid to let go of past projects that are not performing. Take what I have learned from those ideas and put them to use in my new projects is difficult but worth it. It may be that at some point those projects may have a place again or maybe not, but it is okay to move on. As a newbie so to speak in the writing and publishing world I can say that it is fun and exciting to write and create. By following what I love and researching new markets I avoid the discouragement new writers often encounter with the publishing aspect of writing because I am always finding new ideas to work on while those I have submitted find their way to editors. What is your passion and how do you channel that into both writing and the monetary reward that comes with those words? Terri Forehand is the author of The Cancer Prayer Book and the soon to be released children's book, The ABC's of Cancer According to Lilly Isabella Lane by Inkspotter Publishing. 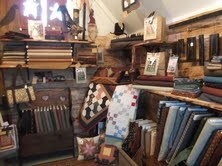 She writes from her rural home in Nashville Indiana where she and her husband have also opened a small quilt shop. Follow her at http://www.terriforehand.webnode.com , http://www.primitive-spirit.com or at her blog at http://terri-forehand.blogspot.com . I love the 4 points you made. Particularly #2. There seems to be such a balance between "doing" and "being". One cannot overtake the other. Great post. I think your four points apply to any creative art. "3 major writing goals". Result is I become overwhelmed and don't ever get to what's really important. Terri, excellent post. I think a lot of writers become a bit weary and discouraged at all the marketing involved in selling books and other products/services, especially when the monetary rewards are slim. And, it can very easily take the passion out of writing. Your four tips are a good way to stay focused and motivated on writing from the heart. Thanks for the encouraging words. It Iis a struggle sometimes to follow these tips but every day offers a new opportunity. Terri, Thanks for the reminder about planning boards, I've laid mine aside and forgotten about it. The article is thought-provoking and encouraging. I get wrapped up in writing to the point of it not being fun anymore. Sticking to those three goals is tough but I received some help from mind mapping on a webinar by Jeff Herring. His guest, Bob the Teacher presented and I got the software Free Mind.